Hey Everyone! The FI (still getting used to writing that) and I met up with college friends for a relaxing weekend lunch. 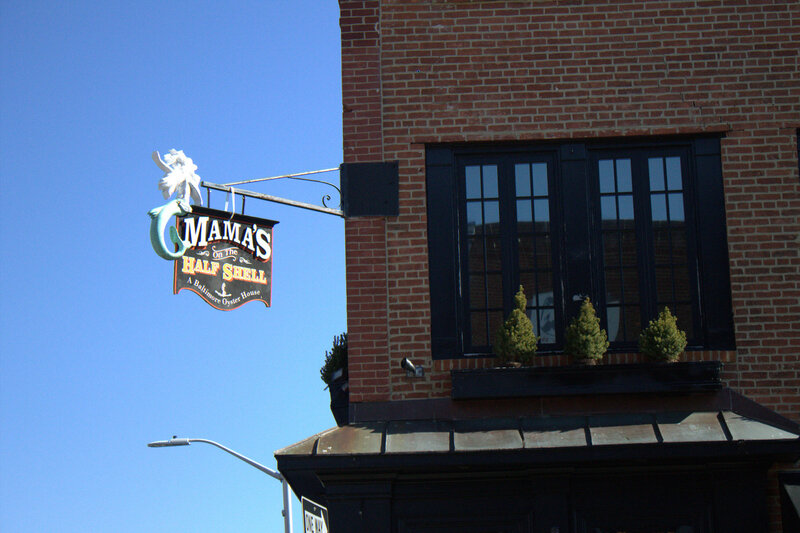 They took us to a popular seafood spot - Mama's on the Half Shell in Baltimore. Thankfully there was zero line when we arrived because we passed one going out the door as we were leaving. It is in the city, so parking can be found on the street. The place is pretty small, thus creating the line of waiting patrons. 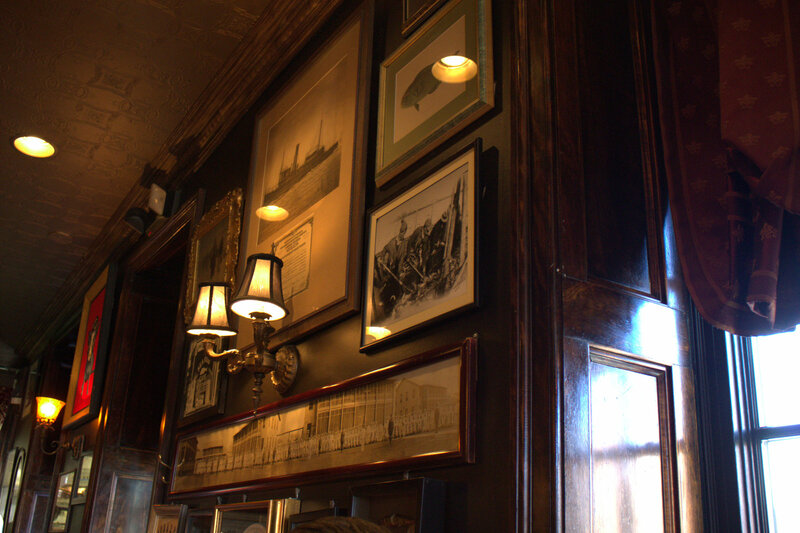 It is two levels of dark, colonial looking decor which looks like 'Baltimore seafood place'. Not sure what that means, but it fits! The vibe is casual, but airing on the nicer side. Our friends ordered a 1/2 pound of Steamed Jumbo Shrimp with chipotle lime cocktail sauce, drawn butter and bread ($9.99). 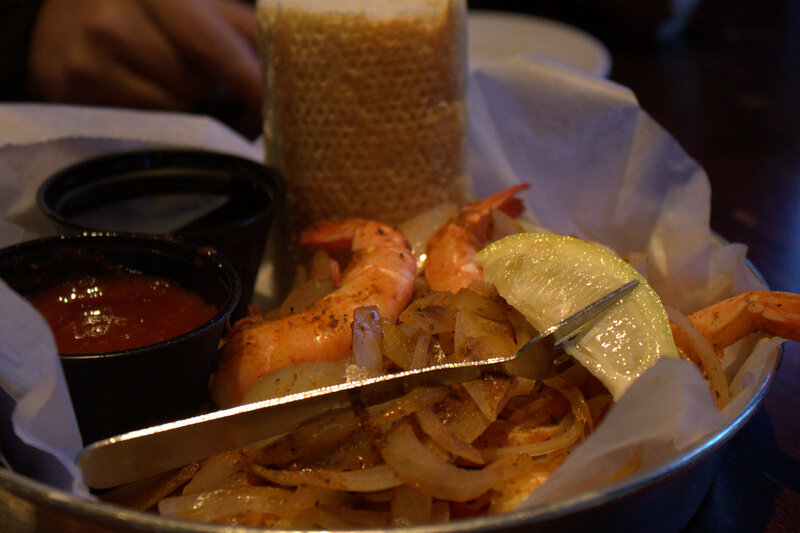 The shrimp were big, and delicious eaten with the sauteed onions. The cocktail sauce didn't taste like it had chipotle lime in it, but was still good. I was craving Cream of Crab, so I ordered the closest thing on the menu. 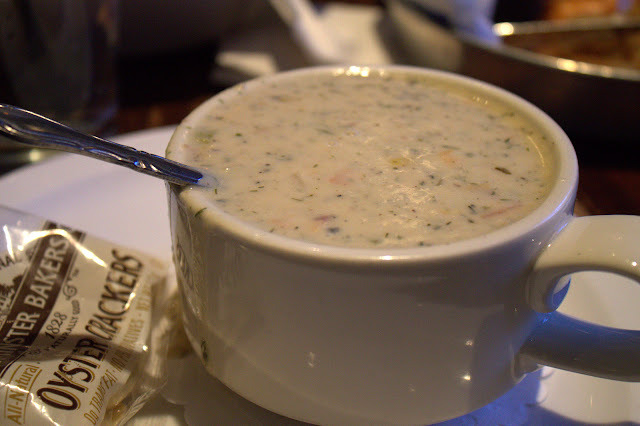 The Seafood Chowder ($6.99) had shrimp, scallops, clams and applewood smoked bacon in a heavy cream base. It was so good and satisfying. It was quite heavy so if I didn't want to stuff myself (which is never), then I could just eat this as my lunch. 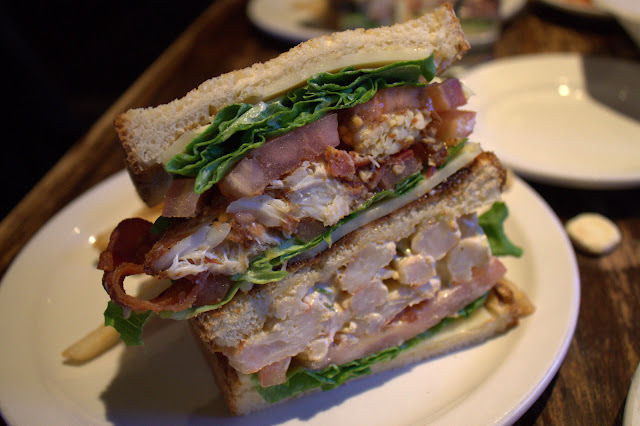 Our friends high recommended this ginormous sandwich! What you see below is only HALF. The Seafood Club ($14.50) comes with a 3 oz crab cake, shrimp salad, lettuce, tomato, mayo, smoked applewood bacon and swiss cheese. You also have the option of fried oysters instead of the crab cake. The shrimp salad had big chunks of shrimp, the bacon was flavorful and you can't go wrong with a crab cake in Baltimore. It's hard to eat because it's so tall, so I took it apart and ended up getting rid of an extra slice of bread in order to fill up on the good stuff. After our meal we stopped by the famous Vaccaro's to pick up some Italian desserts for the road! A little on the pricey side, and not as sweet as typical desserts. The service was quick and nice. They sliced the sandwiches for us and I have no complaints. We didn't get a chance to try any raw oysters as their name suggests, but next time! Happy New Year guys! Not just Lunar New Year, but regular New Year. This is my first post of 2013, and it's good to be back. Lots of positive changes happening including a new job, which will give me more free time (yey!) 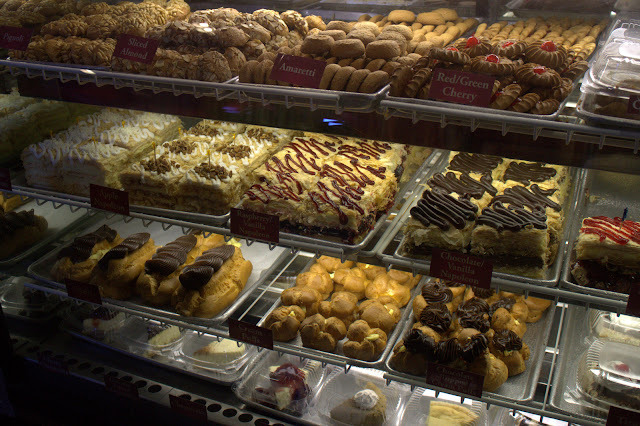 to get back to writing about deliciousness. This past Sunday was Lunar New Year, and I celebrated the 'Year of the Snake' with my dad at one of my family's old stomping grounds. Full Key has served Hong Kong-Style food for decades in this tiny, old shopping center. I grew up in Wheaton, and my mom used to own a hair salon block away. It was nostalgic to be back after 15 years. Parking is limited up front, so there is parking in the rear. Closest metro station is Wheaton on the red line. The interior has changed a bit since I was there last. Structurally, it looks the same, but they've added much more decor. Wallpaper, booths, picture frames and the Chinese roof replica. Even with the changes, the vibe is still very casual and not pretty, but clean. 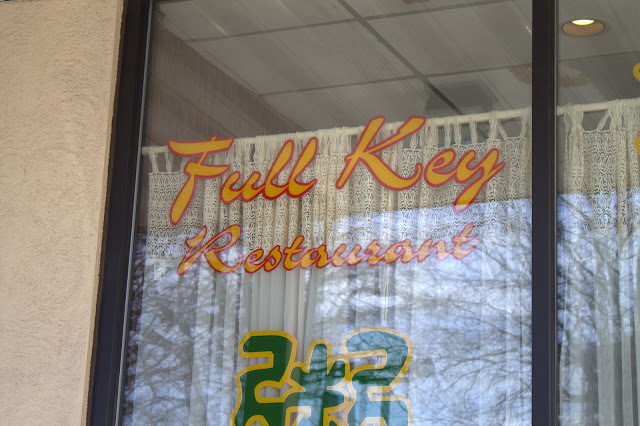 The menu is fairly large, but typical for a Chinese restaurant. 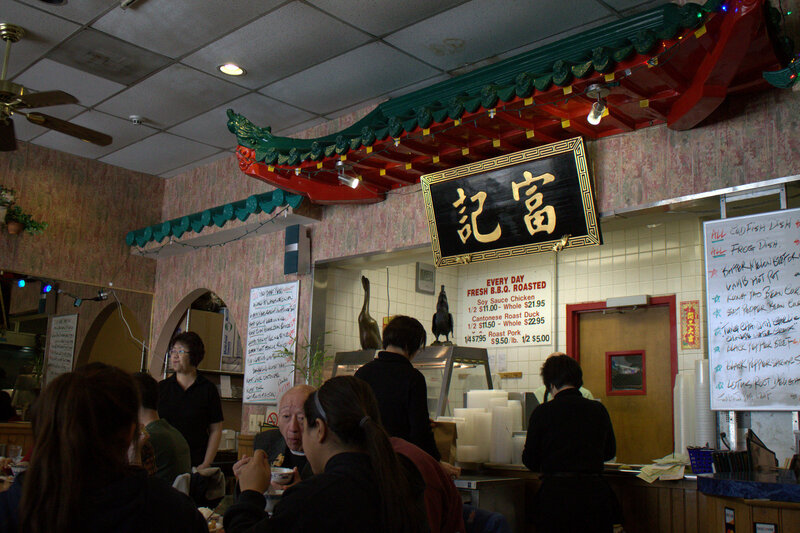 They specialize in Hong Kong-Style cuisine, which means mainly Cantonese influenced dishes. 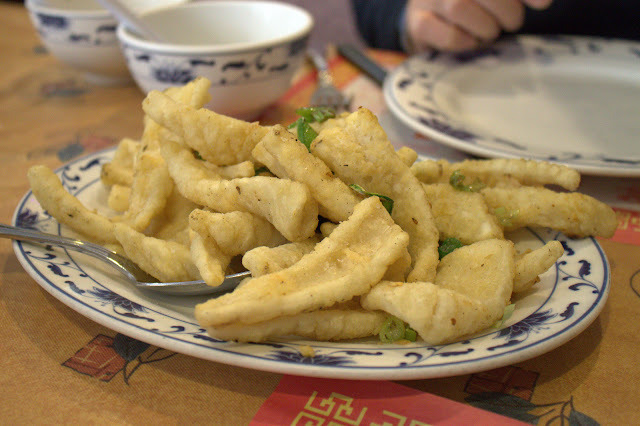 We ordered Fried Squid with Chili Pepper and Salt (around $12), which was surprisingly good. Just looking at it, you would expect it to be boring, but it's crispy and flavorful. Half of the reason for the yumminess was the large amount of MSG sprinkled on top (you could see it), but it's ok once any a while! So good, you don't need to dip it in any soy sauce. The Wonton and Noodle in Soup ($6.75) is a staple item because it's the best around! 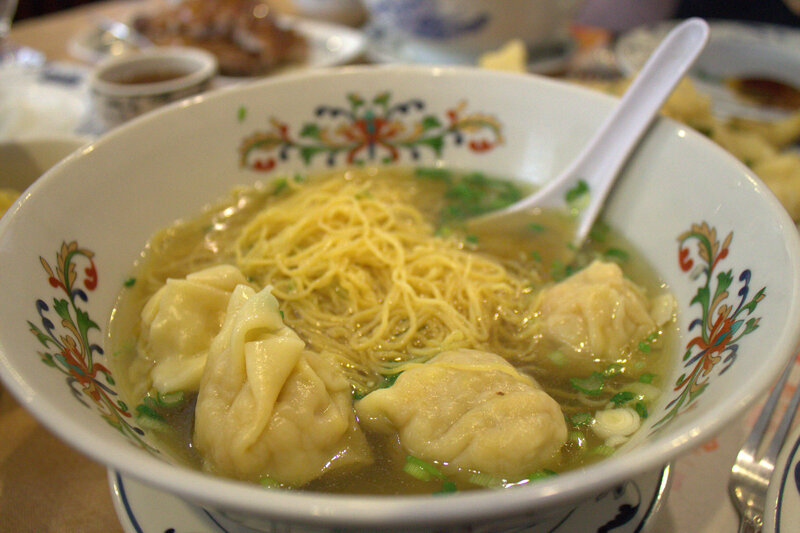 Huge pieces of shrimp inside the wontons, perfectly cooked noodles, and a flavorful sweet broth. It's a huge bowl too, so feel free to share so you can try the next item I'm about to mention. Drool. As a kid, all I would order would be duck on rice. 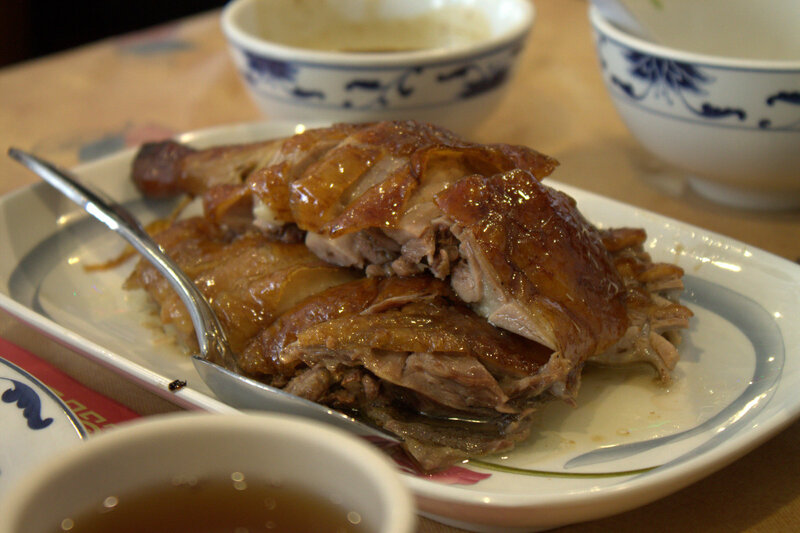 We ordered a 1/4 Roasted Duck ($7.95) which was fatty, crispy and had the right amount of salt. Look at the glistening skin! It was great to be back, and I intend to not forget about this place again. The food was delicious, service was nice and quick, and food was inexpensive.